Let the collections at Technorama Shop AG and Sammlung Oskar Reinhart capture your imagination. Satisfy your inner culture vulture at Kloster Einsiedeln and Munot. You'll find plenty of places to visit near Neuhausen: Seleger Moor (in Rifferswil), Zytturm Clocktower (in Zug), Lokwerk (in Winterthur) and Knies Kinderzoo Rapperswil (in Rapperswil). 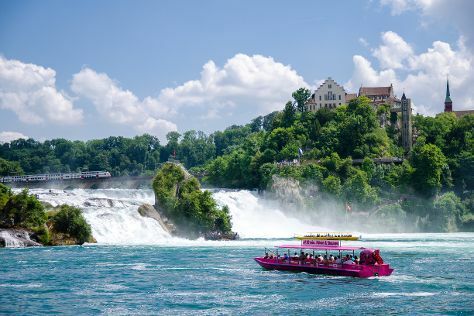 It doesn't end there: admire the sheer force of Rheinfall. For more things to do, where to stay, traveler tips, and other tourist information, read our Neuhausen trip builder. The Route module shows you all the different ways you can get to Neuhausen. In October, plan for daily highs up to 17°C, and evening lows to 7°C.